"There was once a family of Five Little Pigs, and Mrs. Pig, their mother, loved them all very dearly. Some of these little pigs were very good, and took a great deal of trouble to please her. The eldest pig was so active and useful that he was called Mr. Pig. 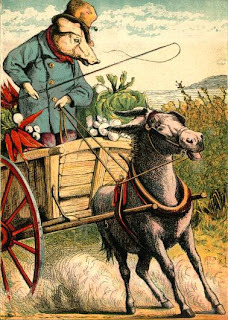 One day he went to market with his cart full of vegetables, but Rusty, the donkey, began to show his bad temper before he had gone very far on the road. All the coaxing and whipping would not make him move. So Mr. Pig took him out of the shafts, and being very strong, drew the cart to market himself. When he got there, all the other pigs began to laugh. But they did not laugh so loudly when Mr. Pig told them all his struggles on the road. Mr. Pig lost no time in selling his vegetables, and very soon after Rusty came trotting into the market-place, and as he now seemed willing to take his place in the cart, Mr. Pig started for home without delay. When he got there, he told Mrs. Pig his story, and she called him her best and most worthy son." The version we all remember ("This little piggy went to market, this little piggy stayed at home, this little piggy had roast beef, this little piggy had none. And this little piggy went 'wee wee wee' all the way home") was first published in 1728. The moralizing in the many longer adaptations of this nursery rhyme is pretty amazing. There are tons of adaptations of "This little piggy..." in popular culture, including Agatha Christie's Poirot novel Five Little Pigs (1942) and a clothing store in Santa Monica called This Little Piggy Wears Cotton.